There are some things in life that you are called to do. You can either listen to the call or make excuses as to why you shouldn’t answer. 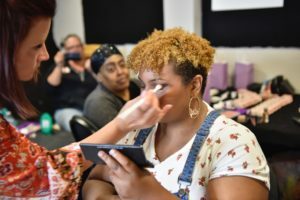 When Nioka “Nikki” Gane, from Dignity for Divas, reached out to me and asked if I wanted to teach a skincare and makeup class for 22 homeless women and women transitioning back into the workplace, I immediately answered my call and said yes. As soon as I said yes, something told me to say no, to find a way to avoid my call and stay in my comfort zone. Something pushed me to keep going. But how do I proceed? I have NEVER done anything like this before. Where do I start? What will I need? What will I say? I am not even a professional makeup artist; there is no way I can pull this off. Fortunately, something was pulling me to my computer, and I started brainstorming. I came up with a plan for how I would run the class, my intention for the women and what supplies I would need. I met with Nikki a few weeks later, she was very honest and said she knew nothing about makeup and this project was all mine. Over the next month and a half, every time I thought about the task at hand, I would get anxiety. 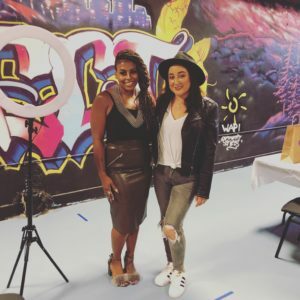 I hooked up with Veronica Moss a talented makeup artist who also manages the Bellevue area for Dignity For Divas. Veronica would be assisting me in the class, and we further brainstormed what was needed and how we were going to get donated supplies for the women, (I learned it is not as easy as I thought). Veronica is talented and has a heart of GOLD! It’s the day before the class. I am running around like a mad woman making sure I have everything I need to help these women feel and look glamorous. I spent forever typing out the perfect speech for my class, I even highlighted and enlarged my key points. I just knew I was going to have to read my script word for word, (which is not ideal), but I was beyond nervous and needed to be pure perfection! It’s literally hours before I teach and my stomach is seriously in knots. I wake up at 6:30 am and start going over notes, gathering all the supplies and making sure I am 100% prepared. My friend Kim, (who just so happens to be in town visiting and is staying with me) asks to join me in the workshop, and of course, I say yes. She is going to be my model for the day. Once we get everything in the car, there is no turning back. We head down to Seattle to the Dignity for Divas headquarters. When we arrive, a young woman is setting up chairs. 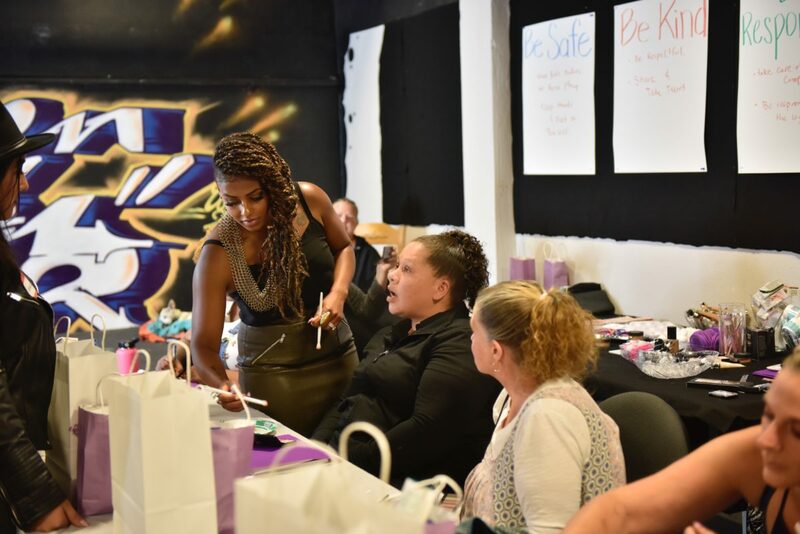 The room has an amazing graffiti wall in the background, and every table is decorated with the Dignity for Divas signature purple. Kim and I jump right in and quickly realize setting up is going to be more tedious than we anticipated. Veronica arrives and we hurriedly open supplies and fill swag bags. We want everything to be perfect for the women, Kim even goes to the store right before the class starts to get last minute necessities. Around 11:00 am, women start trickling in for class. There are refreshments and appetizers, so they each grab a plate and sit down. My immediate reaction is to start talking to them, to break the ice and make all of us feel comfortable. I greet each person as they come in and after a while, I have a full class of 22 women. I grab the several pages of my speech… and then I sit them down. It is like magic; I don’t need to read my speech! Somehow I know exactly what to say, how to say it and when it should be said. I let go and let God and what I say comes natural and directly from the heart. My introduction covers skincare and how important it is to take care of your skin. Next, I show them the types of products to use on their skin, how, and when to use them. Everyone is so into the skincare segment, they took notes, asked questions and even tried out the products. Next, we start the makeup portion. I have no idea what direction this part of the class is going to go. I have my model Kim, and I am ready to show the women how to apply the foundation and eye makeup correctly, it should be reasonably straightforward. There are women of all ages, colors, and levels of makeup-knowledge. Some women don’t know how to hold a makeup brush. This part of the class immediately becomes hands-on. There is no time for me to work on my friend, I need to work with the women. I help each person in the room. My friend gets off her chair and jumps into action to help. Veronica, Kim and I went around from woman to woman and helped each one with their makeup until everyone looked like a runway model. There was not one person that felt excluded, not paid attention to or uneasy. Everyone in this room deserves to be treated the same no matter where they come from or what their story is. It was an honor to be working side by side with them like the beautiful human beings they are. We laughed, shared stories, did makeup and just let loose. The entire process truly became way deeper than just teaching women how to apply makeup. 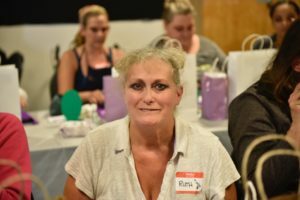 It was all about making a connection and seeing all 22 women’s’ beauty from the inside out and allowing them to see mine. The beauty of it all is that I wanted to have a perfect class and it was nowhere near perfect. That made the class beyond perfect, (you know what I mean). God truly had his hand in orchestrating this entire project. As I reflect, I can see He put so many things in place to make this happen. From me answering His “call,” to my friend that just-so-happened to be in town and becoming a critical roll in helping me with the class. From having just enough supplies to Veronica encouraging me, coming through and having the perfect supplies as well and being the perfect assistant. Last but not least, to one of the most selfless, humble and real human beings I know, Nikki Gane, the founder of Dignity for Divas, thank you for what you do and have done for all these women. You are doing God’s work, your an angel on earth. Thank you for believing in me and trusting me to teach the beautiful women. Kim Clark stepped in and didn’t miss a beat! As I packed up to leave class, I was on cloud nine, I was on a high, not because of what I had done, but because of how those women looked and felt as they walked out of the room. Some had tears of happiness, some even said they loved me, and they thanked me over and over again. They walked out with so much diva confidence inside and out, it made me laugh! I told them they better find somewhere to go and show off their new look! One of the beautiful Divas with her smokin hot smokey eye! Nikki came up to me as I was leaving the venue and said, “You have no idea what you’ve done and how you’ve changed their lives.” That was so deep and I had to think about and let it resonate for a while. I am nobody special. I was just there because I answered the call. “His call.” I will be forever grateful for that call because it not only changed their lives, but it changed mine too. Thank you to Merry Beth and Ms. Whitney for collecting donations and helping with the swag bags. Thank you to South Hill Mall’s Sephora for donating makeup. Thank you to Kathy Evans Beauty Studio for donating makeup. Thank you to Salon Mason for donating makeup and blow-outs. Thank you to Veronica Moss and Kim Clark for being the best assistants a girl could ask for. Please check out Nioka Gane and check out how she is changing women’s lives, at http://dignityfordivas.org.